Two of the sweetest Colombian heartthrobs are teaming up to bring an amazing tour to the United States. Sebastián Yatra and Manuel Turizo will embark on their Tour USA 2018 this October, beginning in Orlando, FL and ending in New York City. The two young talents have each taken the world of Latin music world by storm, conquering fans with hits like "Traicionera" and "Una Lady Como Tú." 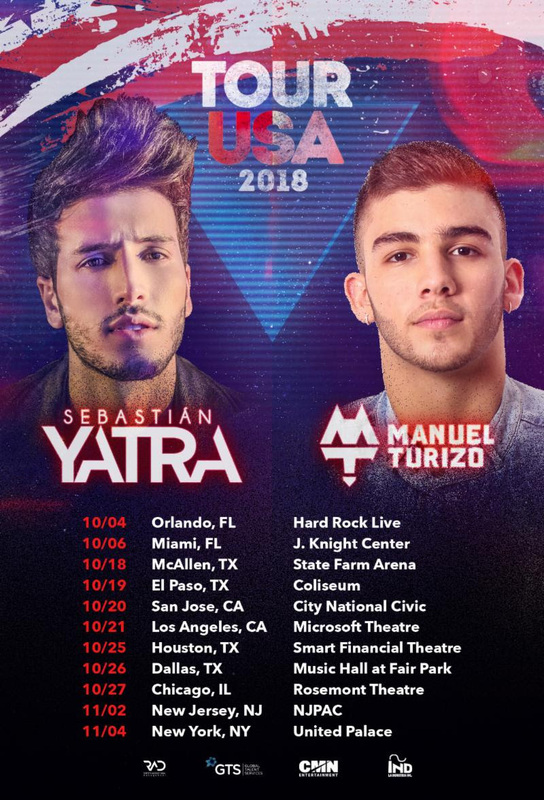 "It makes me happy to be able to fulfill one of my dreams, my first tour in the United States and what better way to do it alongside Manuel and Julian Turizo," Yatra stated, while Turizo shared "It will be very nice to share a stage with Sebastián Yatra...we hope that all of our fans in Miami, Orlando, McAllen, El Paso, San Jose, Los Angeles, Houston, Dallas, Chicago, and New Jersey enjoy this excellent experience that we want to offer them, we're going to leave everything on each stage." More on MNG: Sebastián Yatra Teams Up with Lary Over & Luis Figueroa on "Por Perro"
More on MNG: Manuel Turizo Talks to Musical Notes Global About New Single "Esperándote"